µWave Wizard™ includes three optimizers for meeting user defined performance goals. Within the optimization panel, the user specifies performance parameters and their respective requirements. Dependent or user-defined performance parameters allow for customized optimization and can even be modified during the ongoing process. The most common optimization parameters are scattering matrix elements, beside derived quantities like group delay, isolation or phase differences, electric or magnetic field strengths or resonance frequencies. The optimization process is not limited to waveguide or coaxial structures, typical performance parameters like co- and cross-polar gain, beam width, phase center location, etc. critical for the optimization of antennas can be assigned to the goal function as well. During optimization, the graphical user interface continuously displays performance data updates (i.e. goal function error and visualisation of actual scattering parameters). Furthermore, the optimization monitor keeps the user continuously informed about improvements of the error function. All variables of type ‘optimization’ are continuously updated. The optimization variables monitor includes diagram which shows the current status of the variables during the optimization. This feature is useful for identifying those variables approaching their upper or lower dimensional bounds. Antenna performance parameters like co-polar, cross-polar gain, phase center location, edge taper etc. can be extracted as variables (type “output”). These performance parameters are accessible within the optimization window and support the optimization of the radiation pattern of the horn antenna as well as of the reflector antenna. 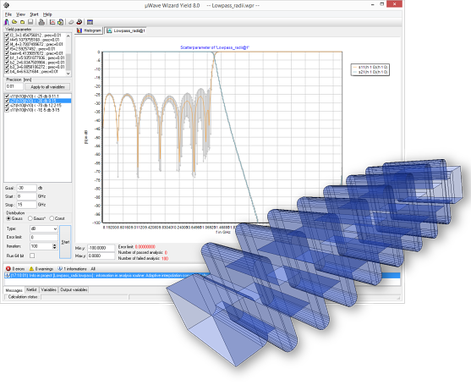 µWave Wizard™ provides the optimization of the antenna pattern of all excitation modes including the optimization of scattering parameters in case the antenna is connected to a complex feeding network or to OMT’s, polarizers, manifolds, etc. 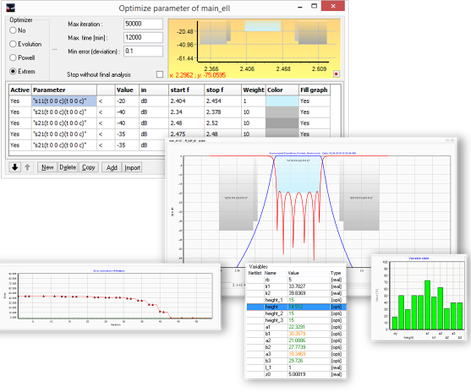 The µWave Yield optimizer performs a yield driven tolerance analysis within user defined tolerance limits for any design. This feature is of importance for determining the sensitivity of any circuit or component design to machining tolerances. Using the precision field in the yield parameter list-box, users specify the tolerance boundaries. The yield analysis uses these parameters for generating a user defined number of designs, all with slightly different geometries within the tolerance boundaries. Finally, the statistical data of the yield analysis is shown in graphs. The interactive tuner allows for "manual" tuning of components or circuits. 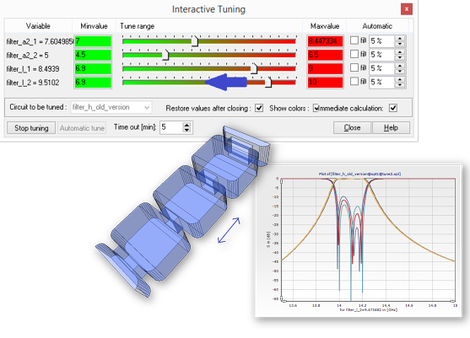 By operating sliders, representing parameterized geometries, components and assemblies can be tuned similar to turning tuning screws on a test bench. Users can perform a fast analysis of a device for various settings, especially if non-tuned elements are buffered for speed. Designers can take advantage of their own personal "bench tuning" experience when using this feature.